What’s your No. 1 goal for patient care? As a nephrologist or nephrology care professional, it’s likely keeping your patients alive. But, according to a recent study performed at the Icahn School of Medicine in Mount Sinai, NY, many patients have a different leading objective. In a survey of 271 older adults with chronic kidney disease (CKR) and their nephrologists, only 35% of patients ranked “staying alive” as their top health priority. In fact, nearly half of patients ranked this outcome as their third or fourth goal, instead choosing “maintaining independence” as their top goal of care (GOC). Furthermore, the study found patients and providers were rarely on the same page for any health outcome. As a healthcare provider, this news might be surprising. You know patient communication and patient-provider accordance is essential for driving positive outcomes. But it’s not always as easy as it sounds. Here are three realistic ways to improve patient communication. The majority of patients on dialysis have not discussed GOCs with their nephrologists, according to a study published by the United States Renal Data System. While many nephrologists discuss care plans with their patients, these conversations often look different if you’ve classified a patient as “high-risk.” For example, you may delve more into a patient’s wishes for advance care planning, life during and after dialysis and end-of-life management if they have an elevated risk of mortality. But instead of only discussing GOCs with high-risk patients, it’s critical you take time to understand the objectives of every patient. Having these conversations immediately after diagnosis can help you make sure you’re aligned on their treatment plan, and can help you clear up any misunderstandings. 2. Have GOC Conversations RegularlyYou know things can change — quickly. A patient who is fully dedicated to their care plan today may eventually decide to skip a dialysis appointment in the future or become careless with their diet over time, especially if you’re not communicating enough. Additionally, a patient may experience complications, or their condition may worsen, and they might not recognize how this new prognosis affects their original care plan and goals. Once you’ve discussed initial GOCs with your patient, be sure to document them and check in regularly. Having these conversations frequently will help your patient feel more comfortable sharing their wishes, will help you become better attuned to their needs and can reduce the risk of patients picking up unhealthy habits that could jeopardize outcomes. 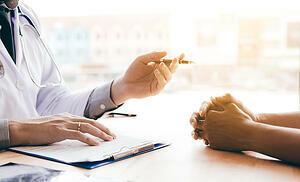 Patient communication is one of the most challenging aspects of practicing medicine, especially when it comes to discussing worsening conditions and other news that can cause emotional distress. However, by discussing goals of care often and ensuring you and your team are fully trained on the best communication methods, you can ensure your patients are getting all the information they need — and that you’re both on the same page.